The Nintendo Switch comes with a pair of Joy-Con controllers attached to either side of the console. Normally, they’re used together to make one big controller, but you can also use each half as a controller for one person on its own. Here’s how to change your controller configuration for different games. The Switch’s controllers work a little differently than most console controllers. For starters, they’re designed to easily pair with other people’s consoles quickly. So, for example, if you wanted to play four-player Mario Kart, you can quickly pair your own two Joy-Con controllers with your friend’s Switch without a lengthy set up process. 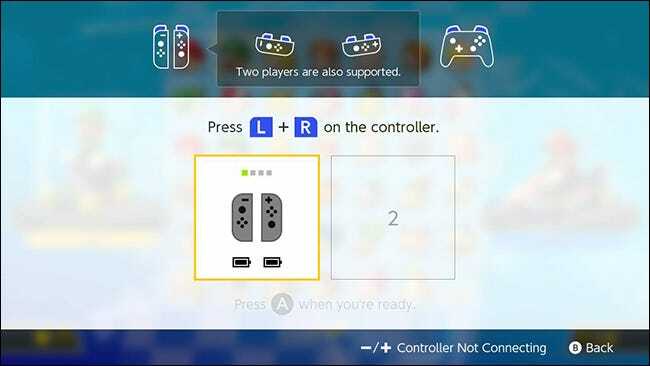 You can also switch from one controller mode to another, depending on how many people are playing. Before we get started, let’s explain how these modes work. In the picture above, you’ll see the two modes you can use your Joy-Cons in. One mode, on the left, uses two controllers at the same time in a vertical orientation. It’s shown above with the Comfort Grip accessory, but you can use them in this mode without it. On the right, the left and right Joy-Con controllers are each in horizontal mode. These can be used by two players. It’s a little more cramped, but it lets more people play. Most games allow you to pick which orientation you’d like to use whenever you need to decide how many players are going to be playing. For example, in Mario Kart, after you start a multiplayer game, you’ll see a screen like the one below. You can also pair new controllers at this screen, if you or your friends have extras they’d like to add to the game. To do so, hold the circular pairing button on the side of the Joy-Con controllers for a few seconds until the green LEDs light up. 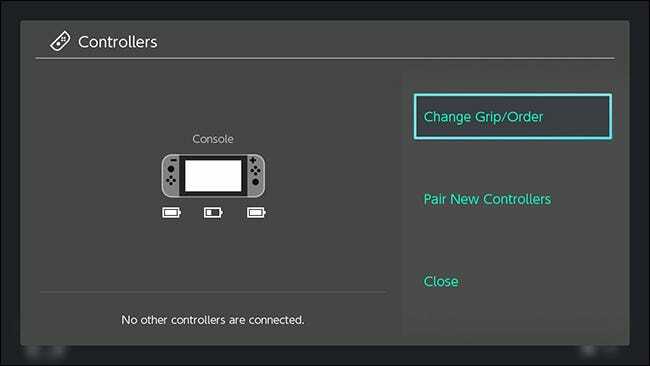 Alternatively, you can slide any controllers directly onto a Switch to pair them to that console immediately. This is particularly handy if you’re borrowing controllers from your friends for multiplayer gaming. 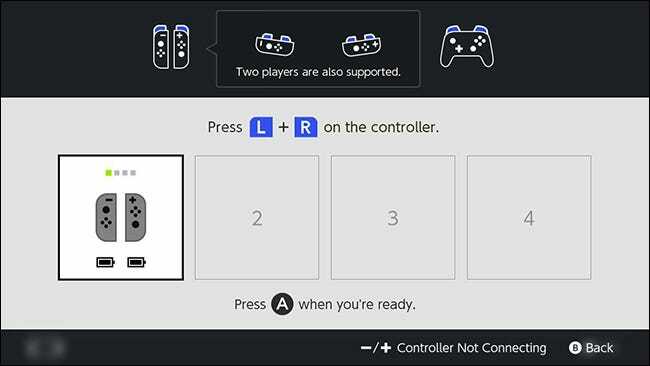 Once you’ve paired each controller in the configuration you want, you should see a screen like the one below, showing how many controllers are paired with your Switch, and in which configurations. 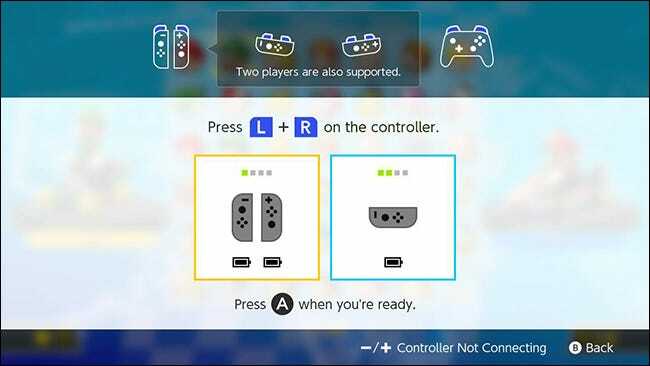 Most of the time, you’ll be able to pick your controller configurations whenever you need to during a game, like before a race or whenever you add a player. 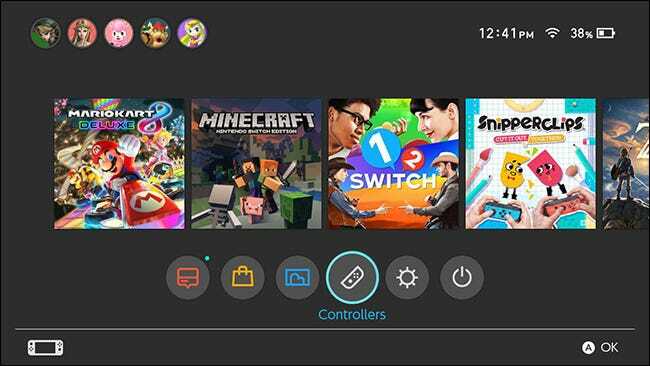 However, you can also change your configuration from your Switch’s home screen if you need to. To do that, select Controllers from the home screen. You’ll see the same screen that games will show you whenever you can change the grip order. Press L and R on the controller or controllers you want in your desired configuration. You can also pair new controllers here if you want. Nintendo’s controllers can seem confusing at first, but they’re versatile enough that you can swap from one configuration to another quickly once you get the hang of it.